And now presenting the long-awaited page 13 of “The Strange High House in the Mist”. Just a few pages to go, and then… well, anyway. Please check in again next Friday! Jason, you’ve lost none of your drawing skills during the long hiatus in this story! Wonderful!! 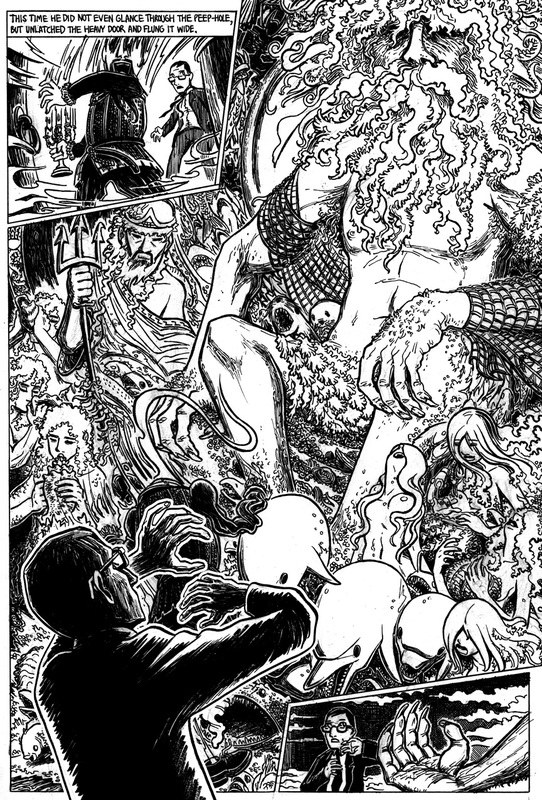 I especially like the way you delineated Nodens’ facial hair as alternately resembling clouds, waves and tentacles. And trident-bearing Neptune, the tritons, nereids and dolphins…..I’m sure HPL is nodding appreciatively from up above (or beyond, or wherever). The depictions of gods and demigods makes me wistful thinking of the adaptation you could do of, say, The Silmarillion…..oh, well, mustn’t be greedy! Forgot to add this comment to my original post–I noticed that Nodens is, appropriately, too large to fit into even an oversize panel! Thanks for the kind words! I’ve vowed never to draw Nodens’ eyes. ;) I probably drew too much of his face in this panel, but even making the questionable assumption that he has eyes, I think they might be beyond a mortal’s ability to behold. Holy crap! An actual update! And I’ve missed it by over a week!